How is it possible to live a moral life if we don’t believe in a god? Without belief in God, some believers shriek hysterically, we would have no moral code. We would believe we would be free to kill and steal and do all sorts of other horrible things. Christians, Muslims, Jews claim that their God gave humanity its moral laws or codes. Other believers attribute moral interests to their respective deities, too. Gods are so interested in the morality of our actions, we are told, that they will even punish or reward people according to whether they have been good or bad. What follows is from a book first published a decade and a half ago so others more in the know may be able to contribute more current insights or simply alternative explanations. 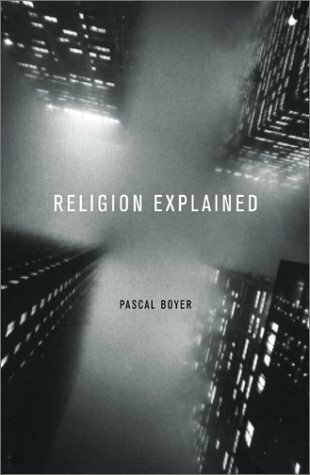 Pending those updates here is Pascal Boyer‘s explanation for why people connect moral interests to gods or spirits or ancestors that he set out in Religion Explained: The Evolutionary Origins of Religious Thought. Boyer begins by addressing the many cross-cultural studies that demonstrate beyond all doubt what all parents have always known: that even young children have moral intuitions. They don’t need to be taught by a thunderous voice from heaven that it is wrong to intentionally deceive someone else with misleading information. No-one taught my infant that it is wrong to lie before he told his first lie with clear signs of associated guilt. Further, young children know the difference between “moral principles” and “conventional rules”. In a classroom, for example, they know the difference between shouting out in class and stealing someone’s pencil case. They also know that stealing an eraser is not as serious as hitting others. If they forget or disregard an instruction not to leave their notebook beside the fireplace they will not be surprised or troubled by the worst consequences in the same way they expect to suffer social ostracism or condemnation for being caught stealing. There is something remarkable about such moral intuitions in the story of our development to maturity. Certain actions are seen as immoral for their own sake no matter what, and that understanding does not change into adulthood. Stealing an eraser is wrong, period. Now there might be circumstances where you, the thief, think stealing it is justified — the owner doesn’t care; its owner stole something from you earlier so stealing the eraser is rationalised as “just deserts”; etc. — but the fact remains we know that stealing the eraser is nonetheless a moral breach. Humans are social animals so we would expect us to have “evolved moral dispositions that are beneficial to social groups.” But we know that everyone is not genetically predisposed to refrain from stealing. People do steal. Societies are not perfect models of cooperation. We know that many animal species demonstrate unselfish acts: birds putting themselves at risk by pretending to be injured to distract a predator from their young; lookout animals that sound alarms to their group when a predator approaches and so themselves draw the attention of the predator; sharing food, and so forth. Kin selection and reciprocal altruism may help explain many such behaviours but they are not the only explanations. Moral behaviour is not simply about rational choices. If everybody in our community was moral on the basis of rational calculations in the sense that they would always steal if they had the opportunity and were sure they would not be caught then society would barely survive. We would trust nobody. But how would we feel towards somebody who was irrationally committed to honesty — even when it was not in their best personal interest? Firstly we would need to know that the person did put themselves in such a position, so we would look for signs such as certificates on their office wall, statements on their business cards, a forthright manner. Such a person has a better chance of winning the trust of others and so gain the rewards of social cooperation. But I have oversimplified the scenario that makes for a generally cooperative society. There is no point embracing a strategy that will make others more likely to cooperate with you if no-one knows you follow that strategy. We need to know that if a financial advisor were to be dishonest and defraud us that there really will be dire consequences. We want to know that someone or some group will share our outrage and pay real costs to punish the dishonest person. If we know that our community is made up of persons who would be very emotionally hostile towards anyone who takes cruel advantage of another, so angry that they really would go to work to punish the criminal severely, we would feel more secure. It is not difficult from this point to understand how we would attribute such moral choices that promote social cooperation for our benefit to a will of the gods or spirits. So certain values are prized in all cultures. Peace is good. So is treating a guest as sacred. No-one argues against those values in principle. The reason we don’t live in a perfect world, however, is because we need to weigh the benefits of cooperation against the risks of denying it. We want peace and have much to gain cooperating with others but should we really trust our plundering neighbours? The potential rewards of safety that come with cooperation need to be balanced against the risks of cooperating with an unknown entity. Our behaviours are indeed rational. My own extrapolation of Boyer’s argument is that we accuse code-breakers of hypocrisy (“you worship a god of peace but wage war”) when we fail to understand the evolutionary function of our moral intuitions and impute our moral codes to gods. There is more yet but this is meant to be a readable sized blog post. But why bring in the gods? Moral intuitions are part of our mental makeup that promote a cooperative society; and we intuit that behaviours are right or wrong by themselves regardless of points of view. A child knows that stealing an eraser is wrong regardless of motive or excuse. Other posts addressing religious or spiritual concepts from Pascal Boyer’s book are archived here. Gods, spirits, ancestors know what’s going on. They know what we do and why we do it. That’s their nature. They can see us and they watch what is happening in our life. Or if they have been busy elsewhere for a time we can always talk to them to bring them up to date. Imagine this situation: You know (a) that there is a banknote in your pocket and remember that you stole it from your friend’s wallet. This situation may produce a specific emotion (guilt). Let me change the context. You took the banknote from your friend’s wallet but also remember (b) that he stole money from you in the first place. This new context will probably result in a rather different emotional reaction, perhaps a mixture of reduced guilt, outrage at his behavior and partly quenched resentment. So your emotions are very much a function of the information you represent about the situation at hand. But that is the crucial point: in either case you assume that the emotion you feel is the only possible one given the situation. Intuitively we assume that anyone who had access to all the information we have that they would make the same moral judgement we make. We assume that anyone who knows the facts just as we do would share the same emotional response to the situation. Intuitively we believe that anyone who could see the whole of any situation (“just as we see it”) they would know as surely as we do where the right and wrong lay and would feel the same way about each party, sympathy or outrage. And gods and spirits are merely extended concepts of persons with special attributes like being invisible. So if you have a belief in such a god or spirit ancestor it follows that that god or spirit would share the same moral judgement as you make and would understand the outrage against the offending party that you have. Most of us have some feeling of guilt when doing something wrong even if we convince ourselves that we have a right to do the wrong thing (e.g. “They deserved their payback!”). Guilt feelings are difficult to analyze or understand. It is also difficult for us to understand why we think certain actions are wrong, even when we feel we have a right to perform them. Consequently they are easy project to an outsider like that god or spirit who watches over all. That is, the guilt feelings tell the believer what the god or spirit thinks about what he or she is doing. Recall that we intuit that certain actions such as stealing the eraser are in themselves right or wrong regardless of how we rationalise them. Posted on 2018-04-28 00:10:17 GMT+0000 by Neil Godfrey. This entry was posted in Ethics & Human Nature and tagged Boyer: Religion Explained. Bookmark the permalink. Oh dear. The choice of the word “parasitic” – loaded as it is with disgust and moral outrage – surely opens the author to accusations of being less than a dispassionate analyst of his subject – of being an “angry atheist” even. I read his use of “parasitic” as having the technical meaning of parasite. It’s introduction in the conclusion of this section was arresting given his overall style aimed at the wider public but the larger tone contextualized the word. I drew attention to it by placing it in the header quotation as a way of capturing the relationship between religious/spiritual beliefs and our genetic makeup. If people judge a book by a blogger’s use of a single word then let them judge without reading it for themselves. Hmmm, that sounds a tad mealy-mouthed: to say that certain activities (painting pictures, playing music) “recruit intuitions” and “mental capacities” is perfectly reasonable (even though I wonder how profound it is: are there any practical or intellectual activities – Boyer seems to conflate the two here – that don’t?) But can you honestly imagine anyone actually saying that “playing a musical instrument is parasitic upon other mental capacities”, let alone that they might expect this to be understood in a perfectly neutral, technical, sense? And what is the techncial sense? A parasite is defined as “an organism which lives in or on another organism (its host) and benefits by deriving nutrients at the other’s expense“. Does the use of this term really make sense in the context of these human activities? The final “summing up” quotation appears to me to answer your question. Boyer’s “parasitic” is introduced as a concluding description of the process he has just described in the preceding sentence which itself follows from the earlier ones. Religious ideas enter and latch on to the fundamental processes of moral reasoning and judging and feed on those host processes to grow and become ever more elaborate and even in many cases take control of whole societies. At least humans are seized by those secondary ideas with all sorts of ramifications. Your reaction to the word “parasitic” is evidently not the same as Boyer’s. If you feel that the word is “cloth eared and stupid” then you will simply have to agree to disagree with Boyer on that point. For that matter if that is how you think of the word then I wonder if there is indeed any sense you can imagine that it could ever be used in a technical sense in other contexts. But to accuse B of being “mealy mouthed”, I think, is to accuse him of being intellectually dishonest. That seems to be to be going beyond mere disagreement over the use of a word that troubles you. You say that you think you understand Boyer’s general thesis. Have you read his book? Neil, Brilliant post! Thank you! I would just like to add that I call an intuitive moral sense a sense of ‘conscience’. We human animals have been graced with ‘consciousness’ and ‘conscience’. These are not limited to human animals but IMO we also have ‘free will’ to do with those as we choose. I’ve had the opportunity, by now, of being able to know, love and witness several people from birth (literally – and I only had one child but was at the birth or near the birth of several) to now in their 20s and 30s. In some people that ‘conscience’ piece is just missing. I could not say why, but having Buddhist and Christian theologies that I’ve interacted with, the Buddhists would say that the person re-incarnated with what they have – or don’t have and need to develop. IMO, the ‘guilt’ feelings are a ‘digestion’, if you will, of a breach of personal conscience. Feelings of outrage and disgust with humanity are an indigestion of collective conscience. The great founders of religions (never intentional on their part) are all people who have fully intact consciences and they have their 7th sense – a spiritual sense – also fully intact. We want that and not in a dispassionate way! We WANT that too. And we should want that. Also, one more thing, ref Jung’s “Answer to Job”, morality and spirit evolve. Our eyeballs don’t evolve that quickly but our collective consciousness and consciences do evolve and experience growth spurts. So what was considered moral 2000 years ago (or 2500 or 1500 years ago) is not what we collectively consider moral now. Right now we are in a period of a global growth spurt of COLLECTIVE, and thus PERSONAL, consciousness (see all the videos online that let us see and hear things from another’s POV) and conscience. We need to keep flexible to keep up with God = the Creative Spirit. Flexibility, hard to do at any age. I really appreciate the discussion! Thank you Neil and David! Katherine, you say that “to SOME extent religions, as they are taught and practiced, CAN be parasitic”, and I fully agree, but that really isn’t what Boyer is asserting. He says that “religious concepts” (not just some) are in their essence “parasitic” on our inherent “moral intuitions”. That’s saying something entirely different. I’m not sure what he means by “to some extent,” of course; that little phrase undercuts the meaningful use of the expression in its technical sense, which only adds to the feeling that he is using it in a vaguely censorious way. I take your point about passionate involvement, but not in all areas: scientific discourse really has to be the dispassionate examination and analysis of evidence. It must be open-minded, as free as is humanly possible from commitment to a particular outcome, otherwise it isn’t science, it’s just pseudo-scientific polemics to further a cause to which one is passionately committed. David, Of course I have not read the book so I’m coming out of left field on this. But when you say “I’m not sure what he means by “to some extent,” of course; that little phrase undercuts the meaningful use of the expression in its technical sense, which only adds to the feeling that he is using it in a vaguely censorious way.” I can definitely agree with you from the limited sense of the book that I have. The only way I can resolve his idea of ” “religious concepts” (not just some) are in their essence “parasitic”” is to juxtapose the notion of ‘religious concepts’ with the actual direct verbatim (as if that is possible) of the actual teachers who apparently founded religions. What Jesus or the Buddha SAID is often (usually? always?) interpreted by their followers who are interpreting it thru their lenses. In that case the very notion of a ‘religion’ is attaching itself in a parasitic way to the original spirit coming directly thru a teacher. Their words, smile, eyes, body language get translated away from the very start as seen thru very flawed human lenses. You’re actually free to steal, rob and do anything else you desire right now. People do it all the time. Look what happens to them if they’re caught. Prison or people shoot back. That’s why we have “man’s law.” People learned long ago that most folks don’t abide by “God’s law.” That’s why “man’s law” was activated. Nothing will change when people start realizing the god of religion doesn’t exist (which is going to take a long while). Charles, If I may, I’m going to change a few of your words so I can understand. Please correct me if I get this wrong. Yes, human beings have FREE WILL. The spirit of creation/creativity has graced us with that. That means we get to play. I’m going to change “God’s law” to a person’s own inner god given sense of conscience. There are situations where your conscience tells you to do something very different than my conscience tells me to do. Individual conscience cannot really be exported to a book. I think it is extremely rare for an individual to have NO sense of conscience. Some have weak or immature consciences. They may go to jail for a period of time but will use that time to strengthen their consciences. After doing their time, they will often try very hard to abide by conscience and man’s laws. But there is that extremely rare person who has no conscience and is glad for it. I would offer Donald Trump as an example. He is the shadow side of America and Americans. For Americans the battle is on. In some cases we protest and in some cases it may just sending love (and maybe a nudge) to our Trump voting relatives who are trying to follow the good book but don’t quite realize they have their own handy conscience that is also god given. Going back to the last 2 sentences of the “Summing Up” section, I would say that action is like a bank deposit or the writing of a book or a legal code. You now have a repository of authority, and whenever a question arises, you can go back to that authority to resolve the matter without having to rethink the moral issue. Needless to say, there is a great advantage in having this resource, but at the same time it can lead to laziness in one’s moral thinking.